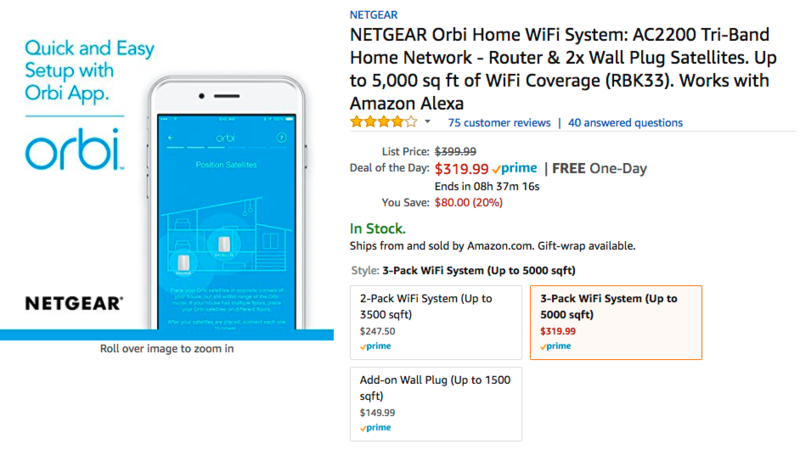 The Orbi three-pack comprises of a WiFi router and 2 wall plug "satellites." This particular kit boasts up to 5000 square feet of coverage, making it perfect for more sizable homes. It can be controlled by voice commands through Amazon Alexa, which is pretty handy. Setup is done through the Orbi app, and you can also create a guest network should you feel the need to. You've got about eight hours remaining on this discount, as it is one of Amazon's Deals of the Day. If you're a Prime member, you'll also get free one-day shipping. You can also purchase an install service for around $70, but I'd imagine that you guys are engaged enough with technology that you know how to set this thing up.